1blu Review 2019: Is 1blu a Good Hosting? 1blu is an affordable option for website hosting. They have over 300,000 customers and provide a full suite of services suitable for beginners and professional website owners. Founded in 2005, 1blu is one of the largest website hosting companies in Germany. With over 300,000 customers, 1blu offers a comprehensive suite of services including website hosting, a website builder, cloud storage, virtual servers, dedicated servers, SSL certificates, and domain name registration. Their website and service is available in German only. There’s nothing particularly spectacular about 1blu’s packages, but their array of features is fairly comprehensive for those looking for all-inclusive solutions. First of all, they offer some great features for beginners. With all of their plans, they include over 100 applications that can be installed with a single click. Most of their plans also feature a free three-month subscription to a website builder that comes pre-loaded with ready-made templates. 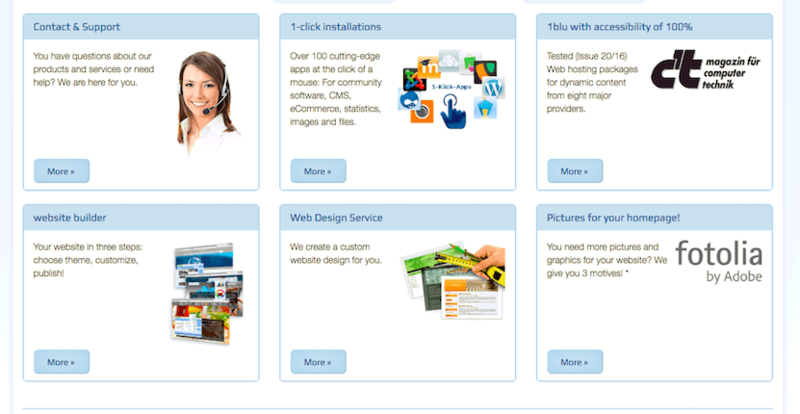 You can build and customize your website with just a few clicks and zero coding knowledge. Note that unless you opt for their higher-tier plans, you may find your account’s scripting capabilities extremely limited. Their most entry-level package doesn’t support any MySQL databases or even PHP, so you won’t be able to install a CMS like WordPress. You’ll have to go for at least their Homepage A package to get MySQL databases hosted on an SSD-equipped server along with support for Perl, Python, SSI, and PHP 5.6 – 7.2. Another downside is that 1blu doesn’t seem to advertise an uptime guarantee, which makes their standards of service a bit suspect. They proudly proclaim that they achieved 100% availability, but the test they conducted was back in 2016 and only over a two-week period, which doesn’t instill that much confidence. 1blu’s prices are very affordable when compared to both German providers and international providers. They offer a variety of price points for beginner users all the way up to large-scale professional plans with significantly better features, although as previously mentioned, their entry-level plans are extremely limited in developer capabilities. 1blu offers a low price per month, which increases after 12 months if you renew. However, they don’t force you to take up a contract longer than 12 months. All contract lengths and terms are the same: 12 months paid upfront, with a one month cancellation period. Contracts are automatically renewed for a subsequent 12-month period unless cancelled by the client. They don’t offer monthly contracts, nor do they offer free trials or money back guarantees. Sadly, I was disappointed with their customer service options as they don’t offer live chat. They do offer email, phone, and fax support between 8AM to 8PM on weekdays. I sent several emails to get support; however, I didn’t receive a timely response. Ideally, I would like to be able to contact support using live chat so I can get an instantaneous response to my questions. This is a budget-friendly provider offering a range of services to suit most users, from the most basic setups to highly advanced websites and businesses. Their most entry-level plans are far too limited to be worth most users’ consideration, however. Wondering how 1blu stacks up against other Web Hosting companies? Enter any other Web Hosting company and we will give you a side-by-side comparison.